"A delight to row, and fast" is how Stuart Pettingell describes his L.F. Herreshoff 17 pulling boat modified by John Gardner (found in "Building Classic Small Craft"). Stuart spent 11 months on the construction, launching the boat in July of 2001. He modified the construction a bit, replacing the single 16' bottom board called for by Gardner with a 4' side keel batten and 1 x 1 mahogany keel. 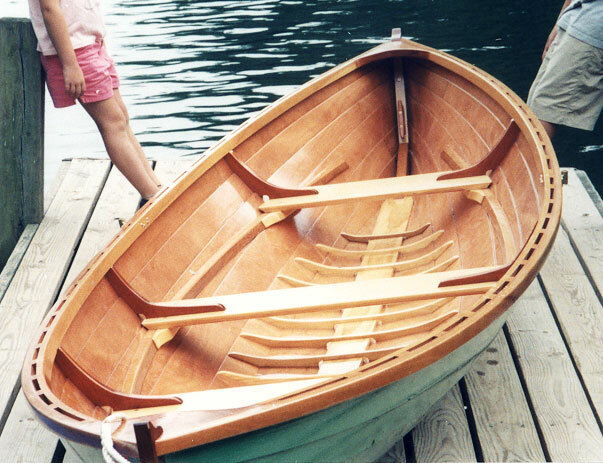 Pettingell used okoume plywood for the glued lapstrake hull, Honduras mahogany for the backbone, breasthooks, and knees, Douglas fir for the inner stems, and Western red cedar for the seat risers and rails. Email Stuart at wspettingell@gmail.com or write him at 2300 Darius Lane, Reston, VA 20191.